ABSTRACT Context: Holotropic Breathwork is a powerful, spiritually oriented approach to self- exploration and healing that integrates insights from modern consciousness research, anthropology, depth psychologies, transpersonal psychology, Eastern spiritual practices, and many mystical traditions. Objective: Holotropic Breathwork offers many opportunities that may enhance treatment, including entering non-ordinary states of consciousness to seek healing and wisdom via a natural, non-addictive method, a direct experience of one’s Higher Power, and for physical and emotional catharsis associated with stress and prior trauma. Design:The experiences of 482 consecutive patients were documented. Patients and Setting: 11,000 psychiatric inpatients from a variety of psychiatric units dedicated to various diagnoses participated in Holotropic Breathwork over 12 years at community hospital. Main Outcome Measure: Transpersonal (“mythopoetic”) experiences were reported by 82% of participants. Results: This procedure was well received. No complaints of adverse reactions were recorded during the sessions nor afterwards on the clinical units. Conclusions: Holotropic Breathwork offers a non-drug alternative for the induction of psychedelic therapeutic experiences. After a hiatus of several decades, research into psychedelic therapies has returned to psychiatry due, in large part, to the advocacy efforts of the Multidisciplinary Association for Psychedelic Studies (MAPS). Holotropic Breathwork was developed by Stanislav and Christina Grof during this interval as a non-drug alternative to psychedelic therapy. The Grofs designed Holotropic Breathwork to give cathartic, therapeutic, transpersonal1 experiences similar to the psychedelic experiences induced by LSD, DMT, mescaline, psilocybin, MDMA, ayahuasca, and other entheogens [Editor’s note: from the Greek,“manifesting the divine within”]. Group Holotropic Breathwork sessions were offered weekly in a community hospital to a psychiatric inpatient population over 12 years. 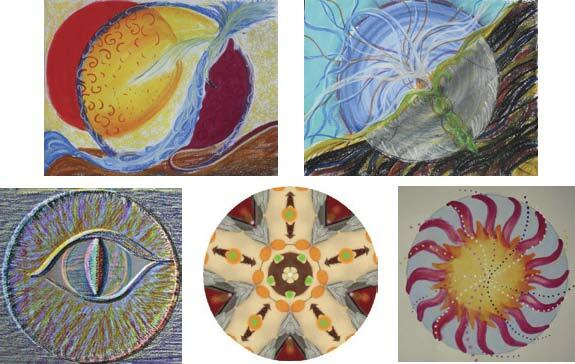 Mandala drawings from Association for Holotropic Breathwork International members Martha Calhoun (top), Mojca Studen (bottom right), Maria Avila (bottom center), and anonymous (bottom right). Holotropic Breathwork was offered to inpatients every Tuesday evening before dinner at the Stress Center of Hyland Behavioral Health, Saint Anthony’s Medical Center in Saint Louis, Missouri, from 1989 through 2001. 20 psychiatric inpatients attended weekly from a number of specialty units: sexual trauma, dual diagnosis, chemical dependency, anxiety, depression, adolescent, and acute intensive care (ICU) for psychoses. The best estimate of the total number of patients is 11,200 +⁄-200. Hospital staff music therapists selected patients, after screening each one based on four exclusion criteria: severe cardiac disease, severe musculoskeletal disorders, pregnancy, and paranoid ideation. The Holotropic Breathwork session was structured for a two-hour time slot. This allowed for a five-minute presentation of the experiential map, 90 minutes of music-Breathwork, 10 minutes for drawing, and 15 minutes of sharing without interpretation of the experiences.This followed the 1988 Holotropic Breathwork format from the first certification training in Breckenridge,Colorado.The 90-minute music-Breathwork session format was the standard of that time.This allowed inclusion of a two-hour music-Breathwork group into the psychiatric hospital activity schedule. The patients received a five-minute orientation to the Grof’s map of Breathwork (psychedelic) experiences;many did not know what they were about to experience.They may have had preknowledge from other patients who had attended that the “music breathwork therapy” was a good group.These experiences are quite non-ordinary and unusual,2 and participants were encouraged not to share them with others who had not been in their session. This was a spiritually naïve population. Some patients were in 12-step programs and had some psycho-spiritual background, but none had previously experienced anything similar to this. We routinely asked if anyone had done any Breathwork or had a meditation practice; not one person reported that they had. experience was rated as perinatal. If only sensory experiences were reported, they were listed in that category. These ratings were determined by the music therapists. 82% of the 482 psychiatric inpatients reported having transpersonal (mythopoetic) experiences. 16% reported experiencing prior life experiences, including what was reported as perinatal experiences in two patients. 2% reported “no experiences.” There were no adverse reactions or unresolved negative outcomes. Among the 11,000 inpatients, the experience was well tolerated.There were no reports of problems with the experience during sharing periods. Furthermore, there were no nursing staff reports of untoward sequelae or complaints after the sessions during this 12 year period. Specific DSM diagnoses and symptoms profiles were not obtained from the medical record; hospital rehabilitation music therapy staff screened patients for the contraindications. ages of 12–14, and later became a runaway living on the street as a drug addict after her older brother, her main support in her family, died in combat. She had recovered in her early 20s but continued to cycle through severe major depressive episodes as an anniversary reaction to the loss of her brother.At admission, she was being treated as an outpatient with fluoxetine (60 mg) and trazodone (50 mg). Her medication was unchanged during her two week hospitalization except for an increase in trazodone to 75 mg due to insomnia.After her first Breathwork session she refused to draw or share. Her affect, however, appeared improved.The next week, after hearing the reports of others in the group sessions, she decided to share her experience: “This is too weird, but here is what happened: In the first session my dead father and dead brother showed up. They lifted me out of my body and took me to a wonderful place full of light and joy; I was so comforted. But then they dropped me back into my body. I just couldn’t talk about it, it was just too weird! In my second Breathwork session, my father and brother showed up again.This time they held my hands and stayed in the room. I could see them with my eyes open; I thought you could see them too.” Her Breathwork facilitator reassured her that he could not see them but that did not invalidate her experience. This woman did well for over three years after which she was lost to follow-up; by that time she had become a leader of a 12step program in her community. The structure of Holotropic Breathwork allows the experiences to be private, in a safe and supportive environment, non-directive, and spontaneous. It is a non-intrusive therapy and offers significant benefits in terms of emotional catharsis and internal spiritual exploration, according to the participants.The lack of even one single reported adverse sequelae in more than 11,000 Holotropic Breathing in-patients over more than 12 years, indicates that Holotropic Breathwork could be considered a low-risk therapy to assist patients with an extremely broad range of psychological problems and existential life issues. These reports support the proposition that therapy with non-ordinary states of consciousness is safe,when done in a supportive therapeutic environment. Specific therapeutic efficacy deserves further research. Holotropic Breathwork and other non-ordinary states appear to be a valuable therapeutic tool. The inpatients’ endorsement in 1989 of Holotropic Breathwork as their best therapy at Hyland Behavioral Health exit interviews swayed the hospital administration to assign extra music therapists to assist in the groups.The four extra music therapists allowed groups of 20 patients, with one facilitator for every four patients.The groups were oversubscribed and filled every week. Hyland Behavioral Health Center was publicly supportive of this work. Their Training Institute sponsored Holotropic Breathwork workshops for the professional therapists in the Saint Louis area. Some of the hospital administrators eventually also participated in the breathwork sessions. Epworth Children’s Home, an adolescent residential program, also introduced Holotropic Breathwork after one of their adolescents returned from the hospital where he had a trans-formative transpersonal experience (conscious contact with his higher power) during the inpatient sessions.4 Epworth’s music therapist, Hallie Huber, trained with the author of this article. We then offered Holotropic Breathwork to interested residents as individual sessions. Huber noted that approximately half of the 52 children-in-residence participated. She also noted no untoward experiences among the adolescents. The experiences of 482 consecutive Saint Anthony Medical Center psychiatric inpatients with Holotropic Breathwork were presented at the Washington University Department of Psychiatry Grand Rounds in 1991. They were also presented to the American Psychiatric/Italian Psychiatric Association in Sienna in 1997, as well as the weekly University of California, San Francisco Depression Seminars in 2007. 2. Stanislav Grof MD., 1988. The Adventure of Self-Discovery: Dimensions of Consciousness and New Perspectives in Psychotherapy and Inner Exploration. SUNY Series in Transpersonal and Humanistic Psychology. Holotropic Breathwork (HB) provides a non-pharmacologic means of attaining non-ordinary states of consciousness (NOSC). HB is a powerful approach to self-exploration and self-healing that integrates insights from modern consciousness research, anthropology, various depth psychologies, transpersonal psychology, Eastern spiritual practices, and other mystical traditions of the world. HB combines rapid, deep breathing, evocative music, focused body work, artistic expression and group sharing in a safe, supportive environment. Holotropic Breathwork was created by the Czech-American psychiatrist and LSD researcher Stanislav Grof, MD, and his wife Christina Grof in the 1970s after studying the use of NOSCs in various cultures and settings. approach to self-Dexploration and therapy. Excelsior Editions/State University of New York. Rhinewine, J. P., Williams, O. J., 2007. Holotropic Breathwork: the potential role of a prolonged, voluntary hyperventilation procedure as an adjunct to psychotherapy. The Journal of Alternative and Complementary Medicine, 13, 771–776. James Eyerman, MD was certified in Holotropic Breathwork and Transpersonal Psychology in 1988. He has been American Board Certified in Integrative Holistic Medicine,Adult Psychiatry,and Adolescent Psychiatry. He is an Associate Professor in Clinical Psychiatry at the University of California, San Francisco and an Adjunct Associate Professor in Clinical Psychiatry at Touro University.Holotropic Breath-work Sessions are offered weekly at his private office group room in Mill Valley. California. Learn more at jameseyerman.com. James can be reached at jimeye108@gmail.com. You may download a pdf version of the journal here.